When it comes to innovations nobody’s been really asking for, right after self-masticating ham, there has to be the idea of self-driving bikes and scooters. 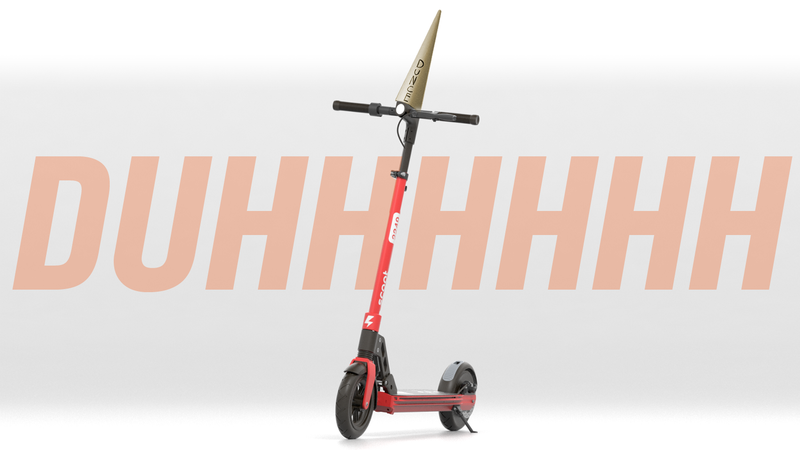 I mean, I guess self-driving anything has some sort of appeal, but when it comes to scooters and bikes, why lobotomize out the one aspect of them that actually makes riding them fun? Well, there is one sort-of decent reason, and Uber is exploring it: shared bikes and scooters that can drive themselves to recharging points or where they’re needed could be useful. But, overall, this seems to be a terrible idea. Even if we accept that making an autonomous bike or scooter is technically possible, just consider what that means: gyroscopes, sensors, computer vision systems, actuators, lidar, cameras, whatever—these things will need all the same expensive electronic crap as an autonomous car, just on a much smaller, vastly less stable platform. Oh, and with the added complexity of a self-balancing system. Plus, all of this hardware is mounted on something that, even if everything is working perfectly, can absolutely fall over. Or get pushed over. Because you know everyone is going to want to push one of these drunkenly teetering things over. And then it can’t get back up, at least not without some complex, expensive robotics. Chances are it’ll just robo-scream HELP PLEASE ASSIST HELP HELP! So, you’ll have a teetery, vulnerable small platform that’s supposed to be inexpensive but no longer is, that’s highly steal-able and full of great-to-resell/repurpose parts, that has to go to recharging stations built somewhere in dense, expensive real estate areas, all for what? Not having to hire some people to collect and recharge scooters? This is a dumb idea. Uber, stop being so dumb, dummy.